Keep your business top of mind with magnetic business cards. Create your own custom message. All orders include Free Standard Shipping! Eco-friendly 16mm magnets made from recycled materials for solid durability. All magnetic business cards come with FREE shipping! Create a unique card for your one-of-a-kind business! Customize your business cards with ease and add a personal touch to your best personal marketing tool. Customers will come to you year round with these postcard size calendar magnets. Make a huge impression for a low cost! 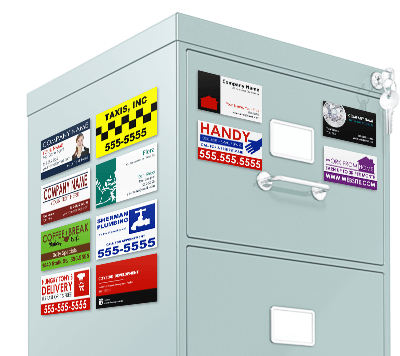 BuildASign is your best online source for personalized business card magnets. Make a unique name for yourself and your company at networking events, conferences, or anywhere the professional world takes you with our quality, full color magnetic business cards. Our durable, eco-friendly, 16mm magnetic business cards are the best when you need to impress!